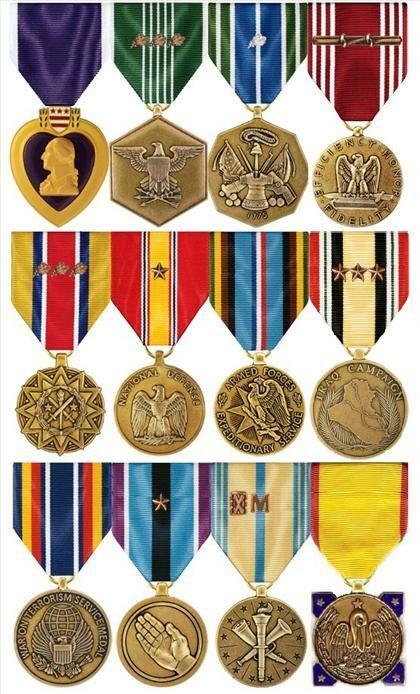 Medals earned over 15 years of honorable service to this country. Top Row: Purple Heart, ARCOM w/3 oak leaf clusters, AAM w/1 silver leaf cluster, and GCM with rope device and two knots. Middle Row: ARCAM w/3 oak leaf clusters, NDSM w/1 bronze service star, AFEM, and ICM w/3 bronze service stars Bottom Row: GWOTSM, HSM w/1 bronze service star, AFRM w/Bronze Hourglass & 'M' devices, LA Emergency Service Medal Here is the official certificate I received for my award of the Purple Heart for wounds received in combat, 12 Apr 2004. 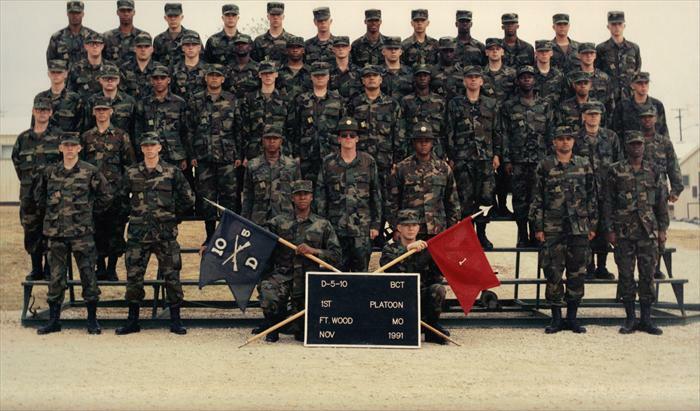 Picture of my Platoon taken in Basic Combat Training (BCT) at Fort Leonardwood, Missouri in Nov. 1991. 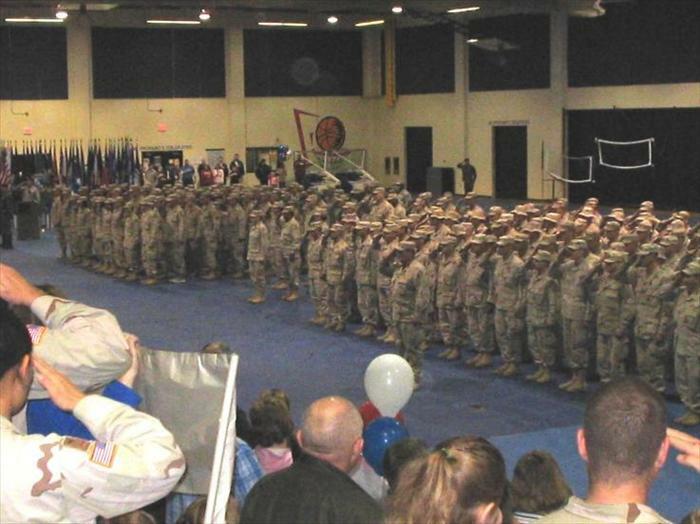 I was in D (Delta) Company-1st Platoon, 5th Battalion, 10th Infantry Regiment. I'm in the top row, fifth from the left. 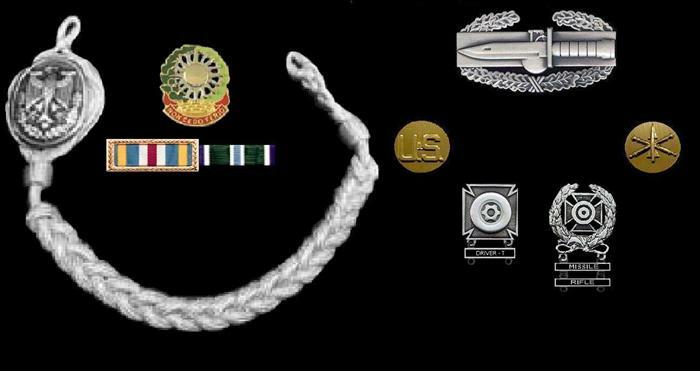 Additional awards- Left side: Foreign Award-German Army Marksmanship Badge (Schützenschnur) in Silver Regimental Crest-3rd Air Defense Artillery (ADA) Citations: Joint Meritorious Unit Award & Coast Guard Meritorious Commendation Top Right: Combat Action Badge (CAB) Collar Discs: Air Defense Artillery Enlisted Collar Discs Qualification Badges: Drivers/Mechanics Badge with 'Driver-T' (Tracked Vehicles) Qualification Bar & Army Expert Marksmanship Badge with 'Missile' (Stinger) & 'Rifle' (M16A2) Qualification Bars SSI worn, Top row from left-to-right: 3rd Infantry 'Marne' Division (Location-Kitzingen, Germany), 4th Infantry 'Ivy' Division (Location-Fort Carson, Colorado), 81st Armored Brigade (Location-Seattle, WA), 94th Air Defense Artillery (ADA) Brigade (Location-Hanau, Germany; Bottom row: 69th Air Defense Artillery (ADA) Brigade (Location-Hanau, Germany), 2nd Infantry 'Indianhead' Division (Location-Fort Lewis, Washington), Redesignated 81st Brigade Combat Team (BCT) (Location-Seattle, Washington). 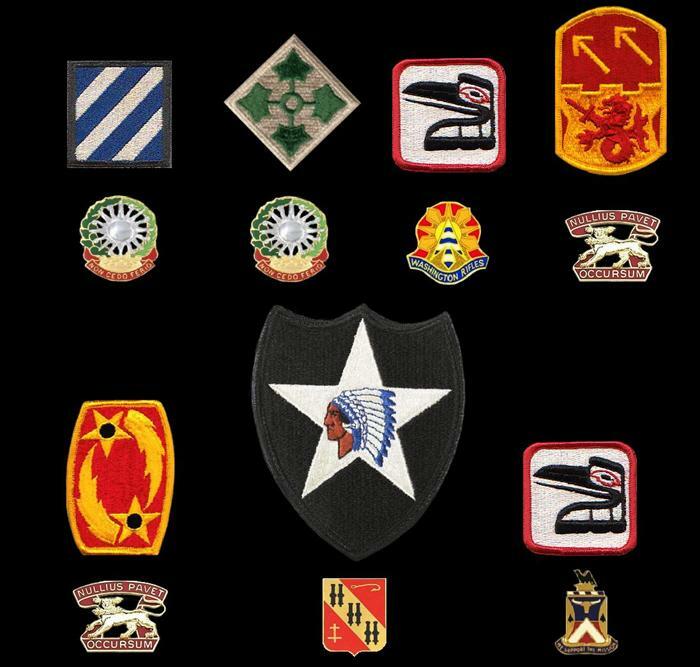 Distinctive Unit Insignia-Top Row: 3rd ADA Regiment (Assigned unit-4th Battalion, 3rd ADA), 3rd ADA Regiment (Assigned unit-1st Battalion, 3rd ADA), HHC 81st Armored Brigade (Assigned unit-HHC 81st Armored Bde), 7th ADA Regiment (Assigned unit-5th Battalion (Patriot), 7th ADA). 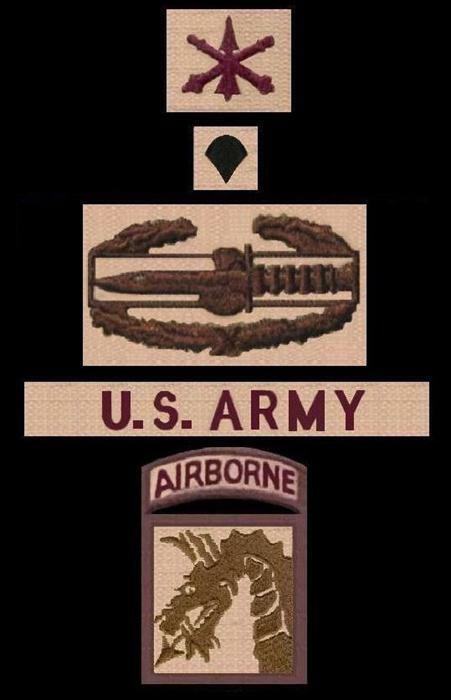 Bottom row: 7th ADA Regiment (Assigned unit-5th Battalion (Patriot), 7th ADA), 5th ADA Regiment (Assigned unit-C Battery, 5th Battalion, 5th ADA), & 181st Support Battalion (Assigned unit-HHC 181st Support Battalion) Desert subdued patches & insignia from top-to-bottom: Officer ADA branch sew-on, Specialist collar rank, Combat Action Badge, U.S. Army nametape, and my Shoulder Sleeve Insignia-Former Wartime Service (SSI-FWTS)-18th Airborne 'Dragon' Corps Patch. 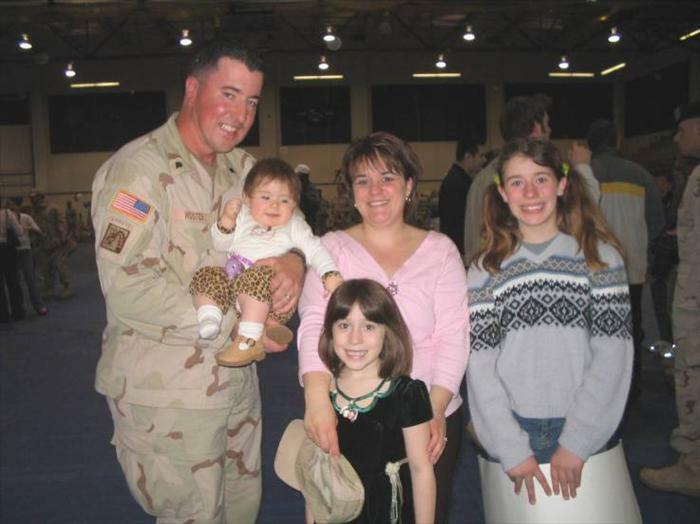 Picture of me and my beautiful family at our 'Welcome Home' ceremony at Fort Lewis, WA., March 2005. 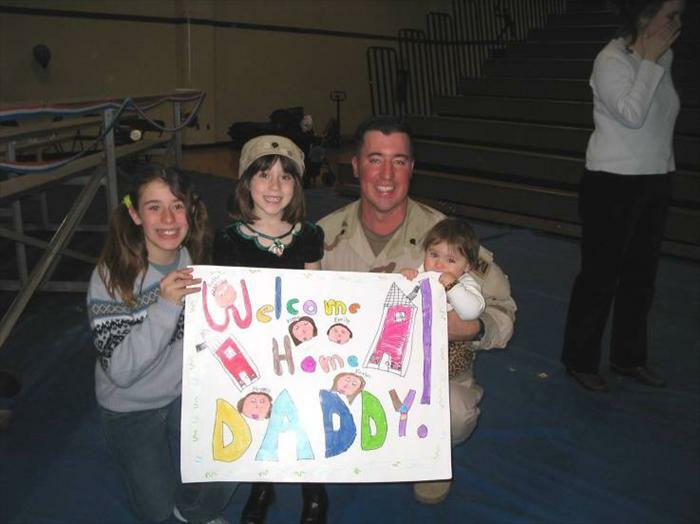 Picture of me and my girls with the 'Welcome Home Daddy' sign they made just for me! 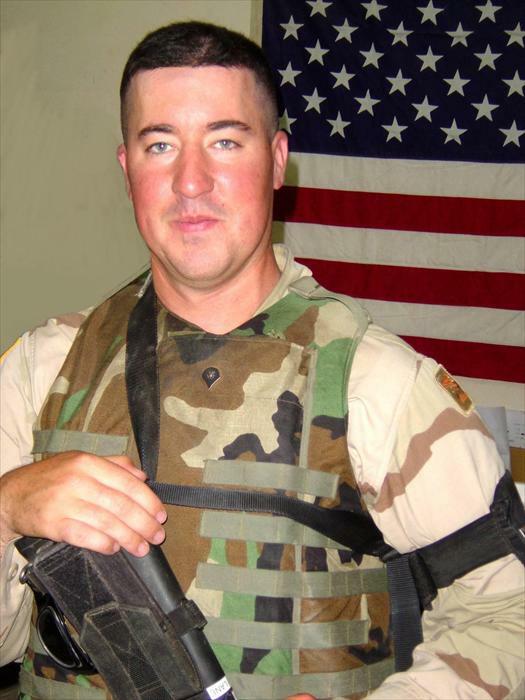 March 2005. Reunited with my youngest daughter whom I haven't seen in 8 long months. Two of my older girls welcoming me home. 'Present arms!' 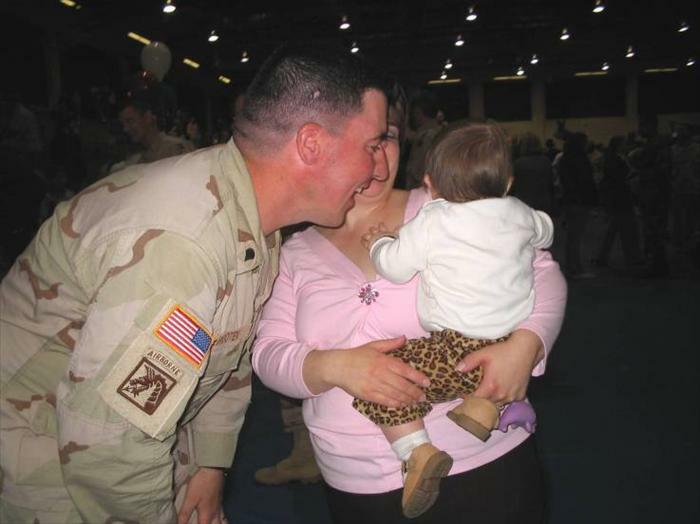 One last time before being released to finally reunite with our families! Picture that someone happened to snap of me as I was coming out of our battalion HQ. 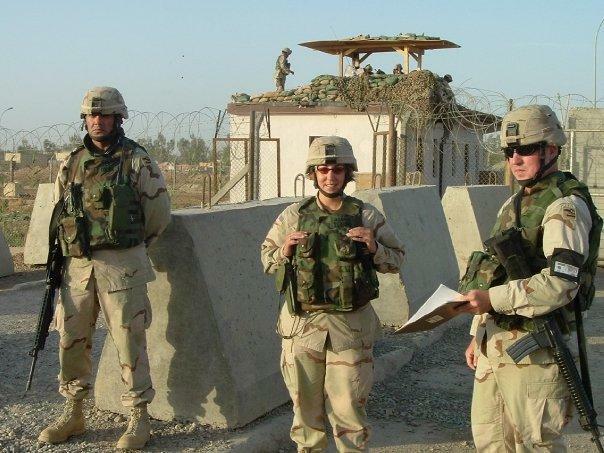 East Entry Control Point crew during the Christmas of 2004. Picture was taken at the end of our shift after being out in the torrential downpour all day! Good times! Entry of bridge leading to the main entrance of the EECP. View from tower. 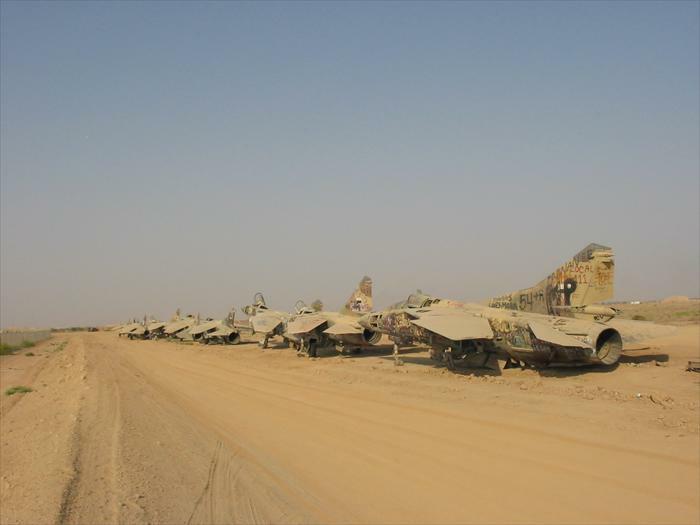 Picture taken 2004. 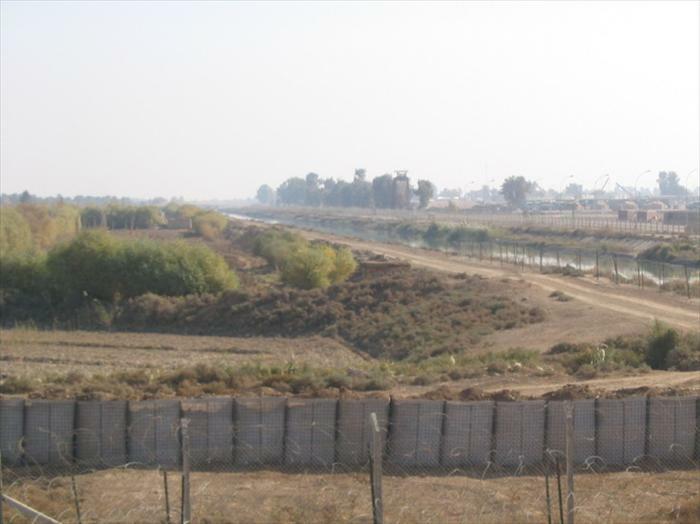 EECP view to the south, taken from the outer perimeter guard tower. 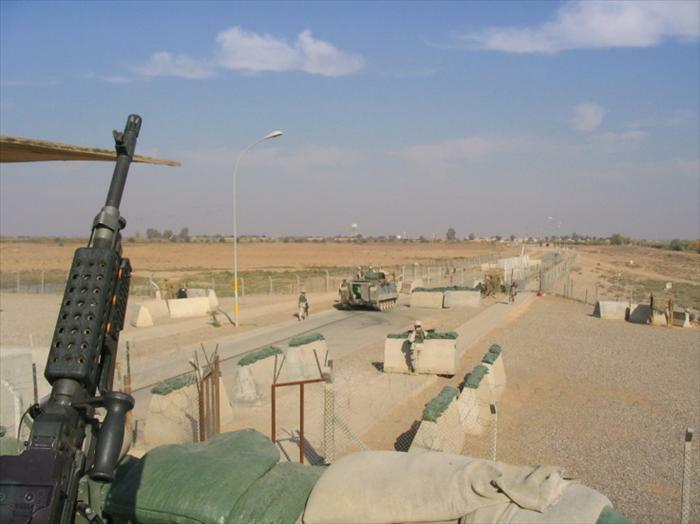 East view from the 'Sniper's Look out' looking towards the vehicle convoy entrance of the EECP. 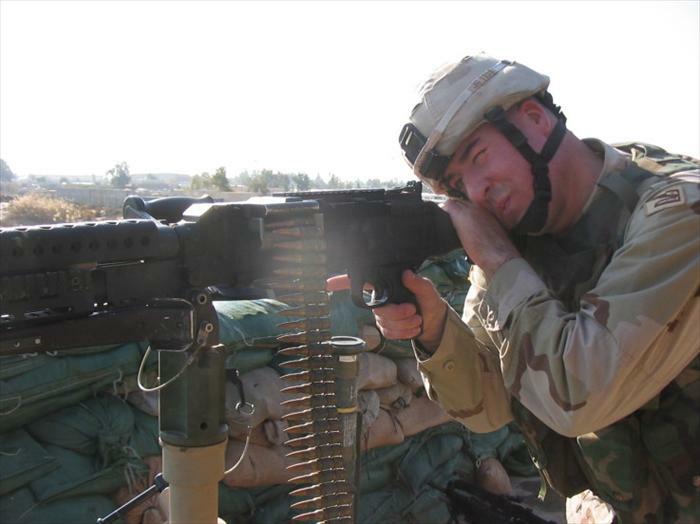 Pic of me manning the 240B Machine Gun providing overwatch, as a military convoy enters the main gate. 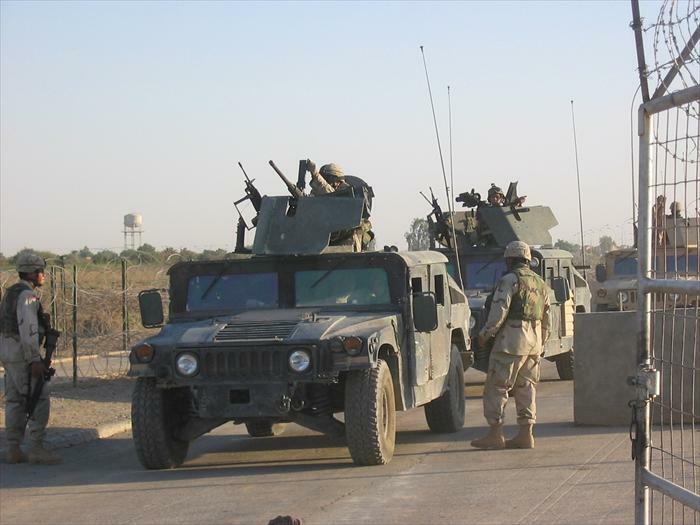 Military convoy entering the EECP main gate. 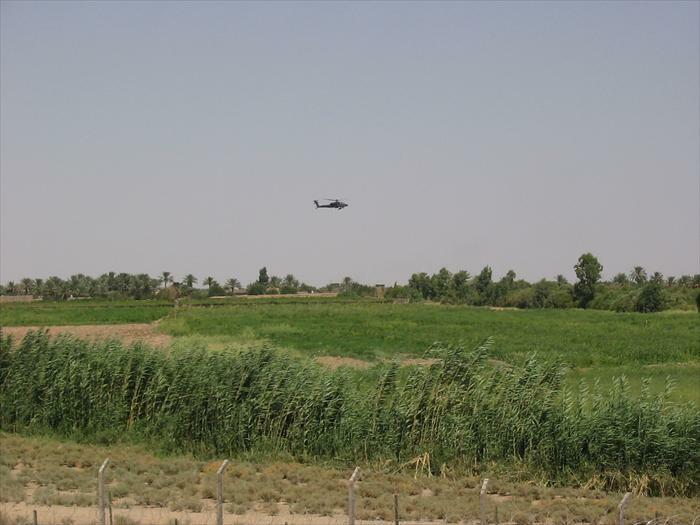 Picture of an AH-64 Apache helicopter flying by the EECP above the farmland that surrounded our base. 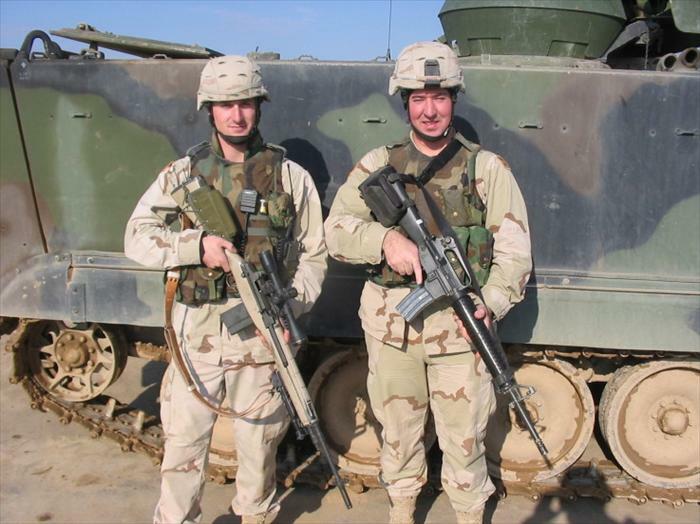 Picture of Specialist Jeffrey Dickerson (our 'Designated Marksman' or DM) holding a modified M14 rifle and myself cheezin' for the camera. 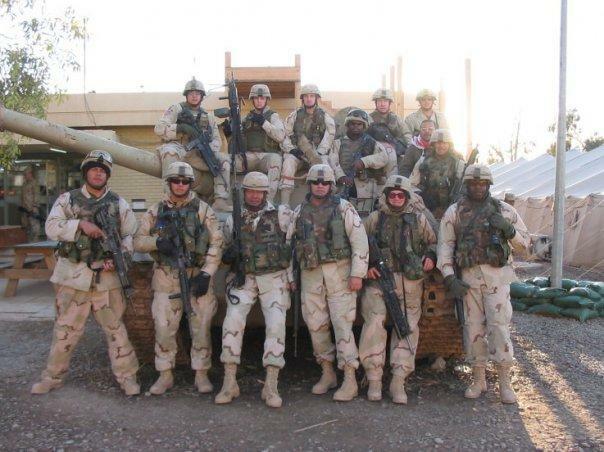 Nearly the entire EECP crew stands for a group photo on a former Iraqi Army (Russian-made) T-55 Tank. 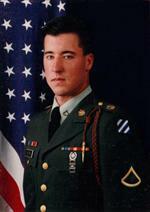 Taken summer of 2004. 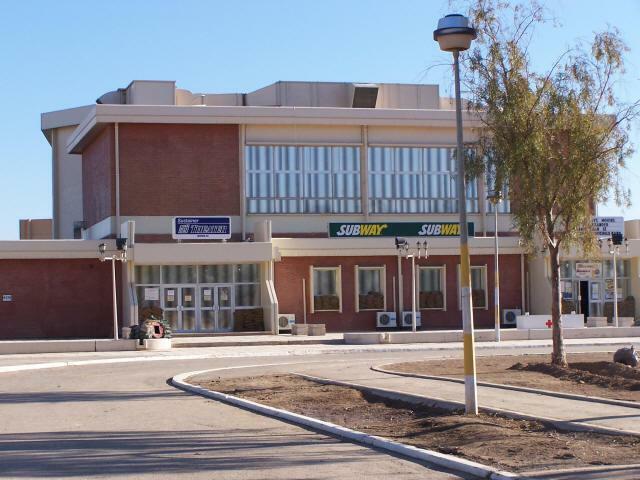 Closeup of Main Post Exchange (PX), notice the large concrete Jersey barriers that are directly in front of the main entrance. 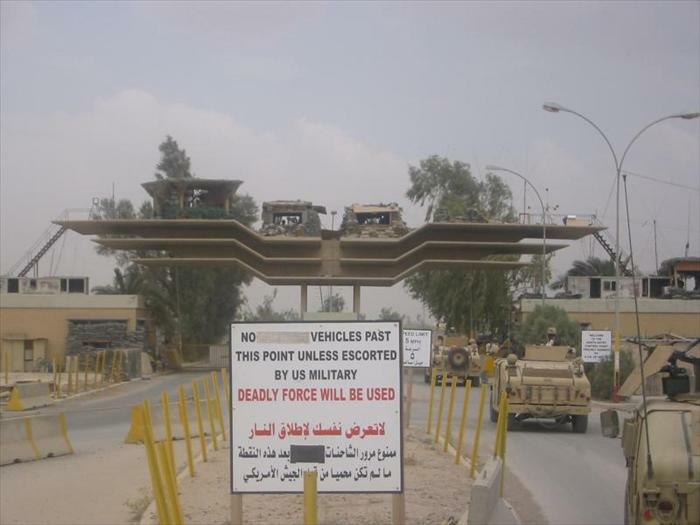 These were erected after a large 122mm mortar hit the front of the PX in June 2004, killing one soldier and wounded dozen or more. 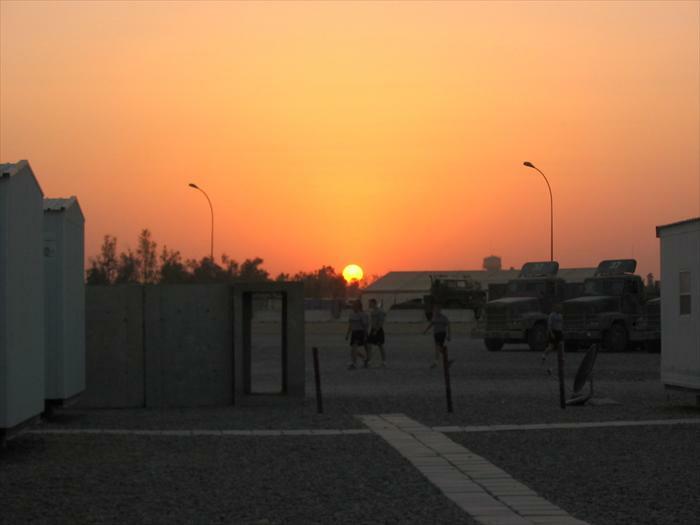 A lovely Iraqi sunset over our living area. Love the accommodations! 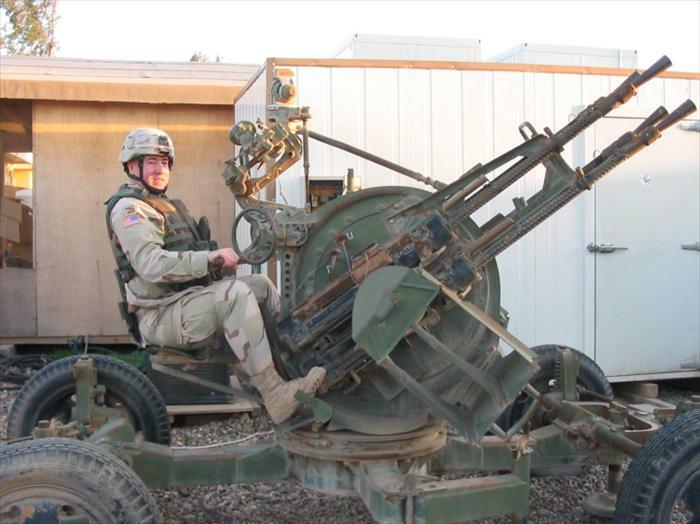 Photo op; me sitting on an old Russian-made, quad machine guns-AAA (Anti Aircraft Artillery) weapon system. On duty at the EECP. 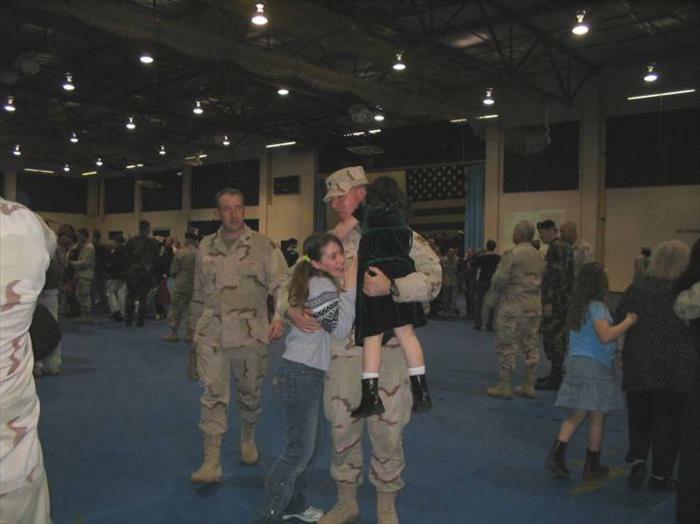 From left-to-right: Staff Sergeant Rene Dolan, First Lieutenant Anne-Marie Stormo and myself. Here's an aerial view of our oh so 'lovely' trailer park. All kinds of mischief went on here...use your imagination (heh, heh). Don't you love how the higher-ups thought it was so good to have our trailers so close together? Makes for a large kill radius, don't you think? 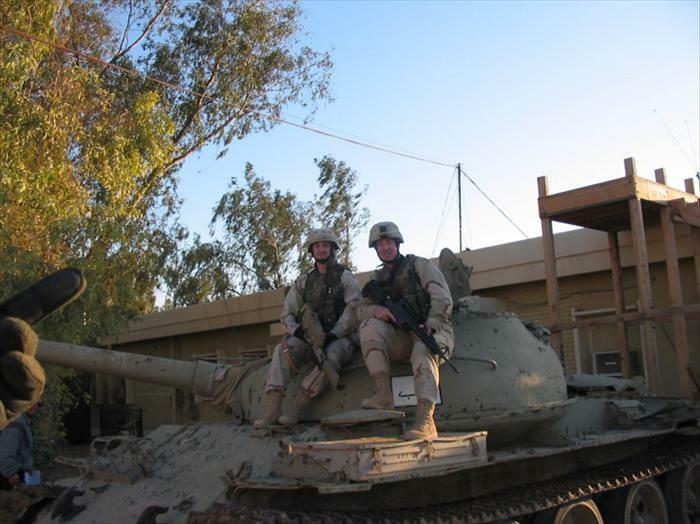 Specialist Dickerson and I posing on a T-55 Russian tank in front of our Battalion HQ. 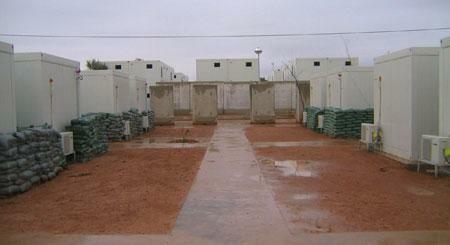 Another pic of our lovely 'hooches' that we lived in the last six months or so during our time at LSA Anaconda. They had A/C that worked (when we didn't have 'brown outs') and were relatively comfortable. The only bad thing was if a mortar or rocket landed near one, it turned a hooch into hundreds of bits of flying shrapnel. That made for a very bad day, indeed! 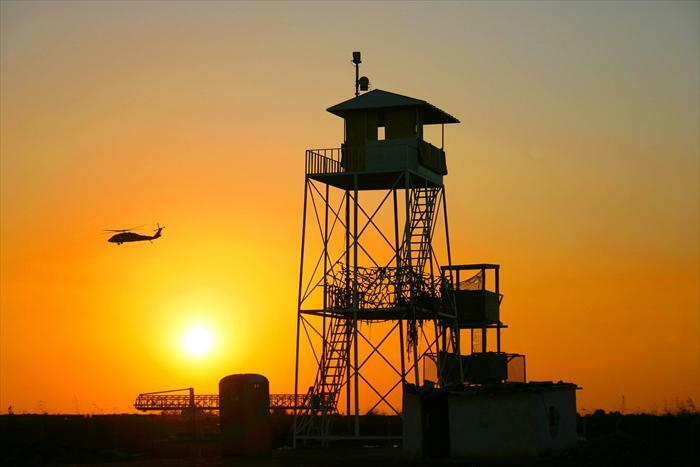 One of our many guard towers located along the large perimeter fence of LSA Anaconda. 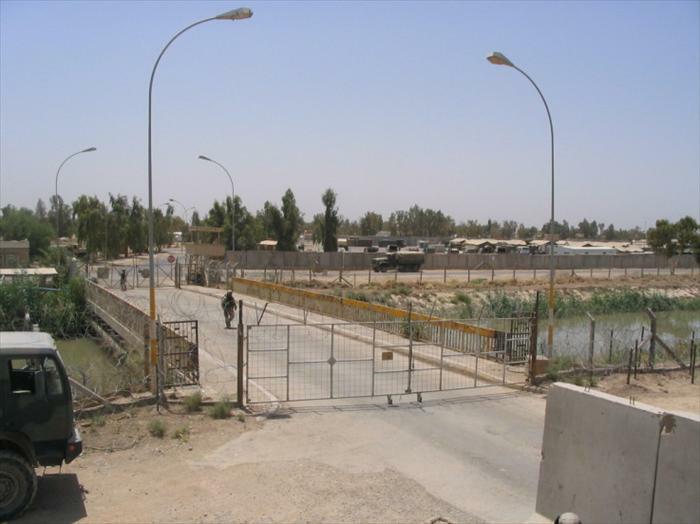 Picture of the North Entry Control Point (NECP) aka 'North Gate.' 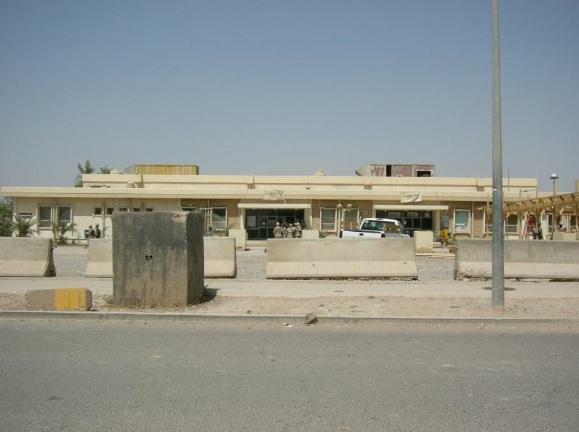 This was the primary entry control point of the base and was the main departure and entrance for military convoys. 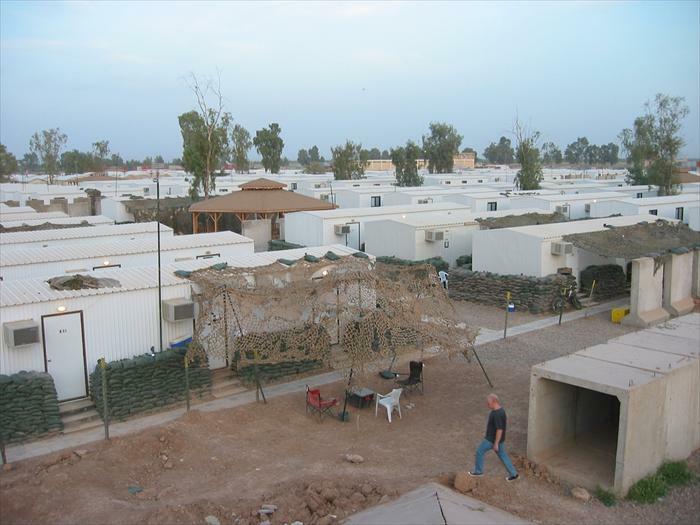 It was also where civilian and military supply trucks were inspected. 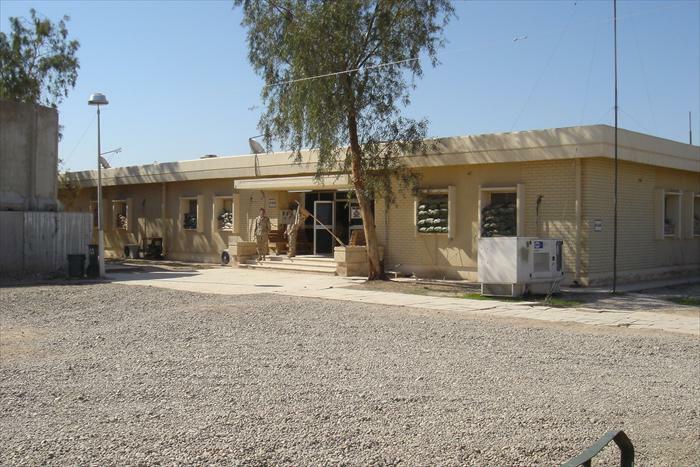 An example of one of the building seen throughout Anaconda that were refurbished and used as battalion headquarters. 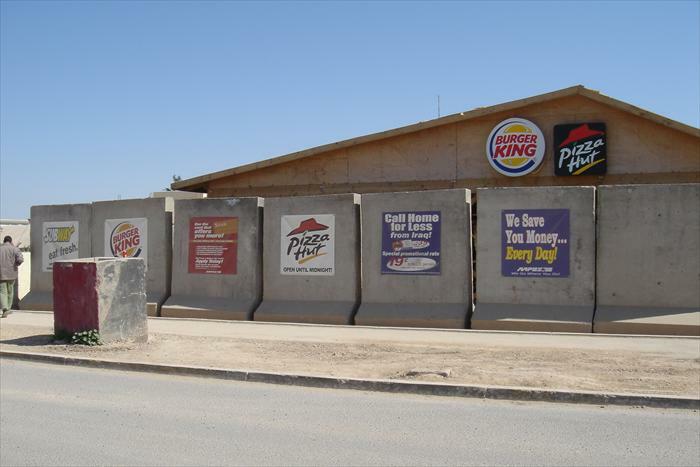 Even in a combat zone, you can't escape it; fast food chains! 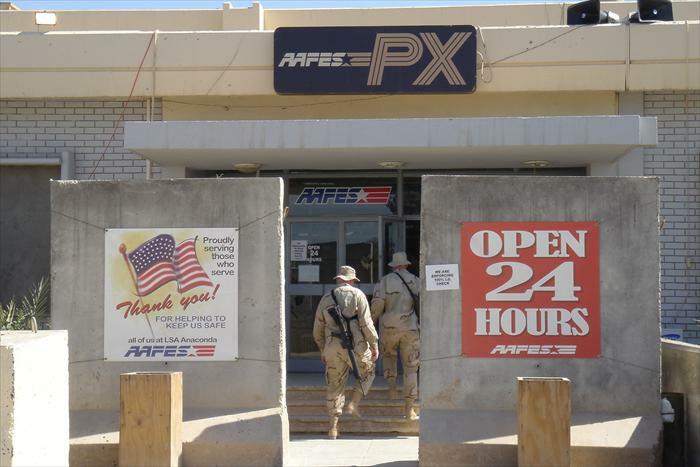 Even in Iraq we had the comforts of home, to include some well know fast food joints. But you couldn't eat this stuff everyday if you worked indoors. 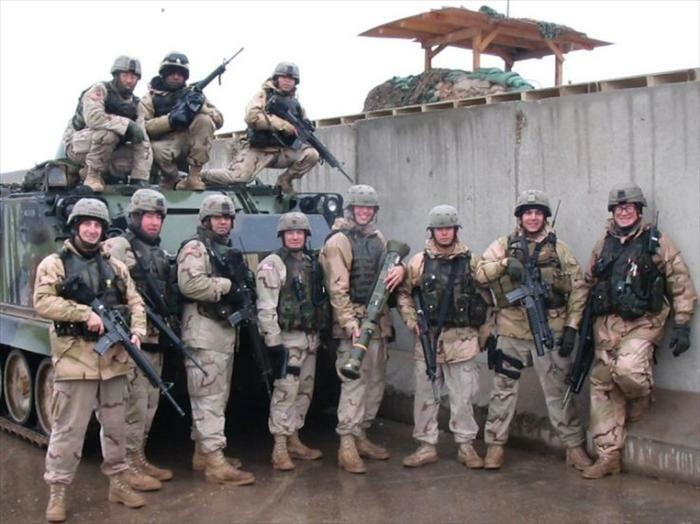 For those of us who worked 10 to 12 hours a day in all our combat gear didn't have this issue. Front view of Anaconda's Main Post Exchange. 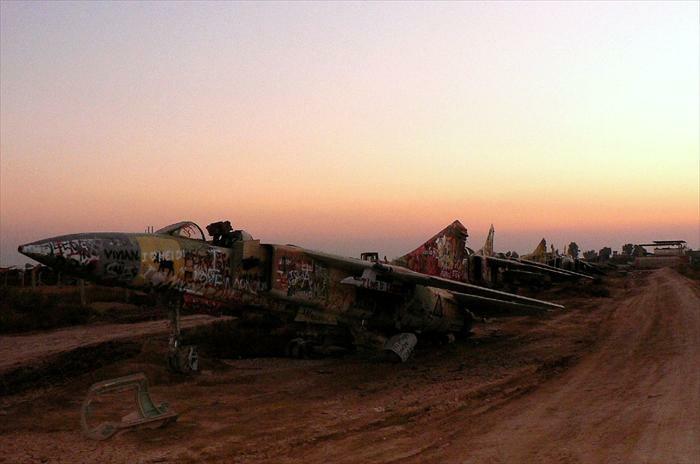 A picture of 'Mig Alley,' remnants of the Iraqi Air Force that was left-over on the base from the Desert Storm era. This is 'Sustainer Theater,' which was refurbished by 3rd COSCOM. 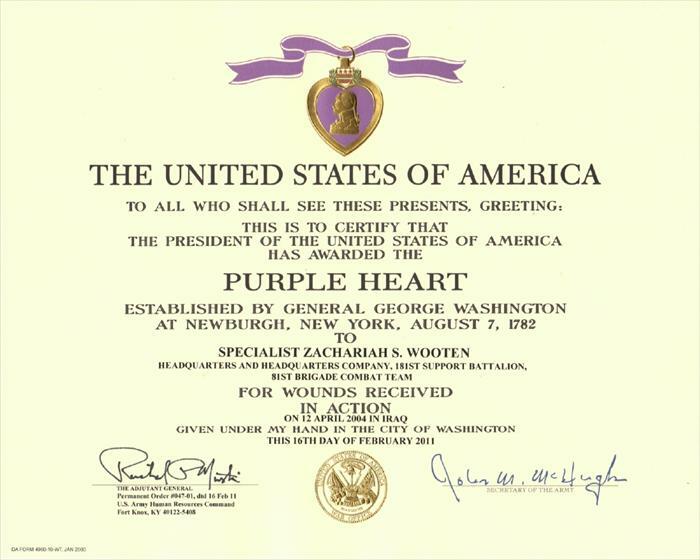 It showed nightly movies and was free to servicemembers and government contract civilians. They showed first-run movies and were only behind about two weeks. Inside it was air conditioned and had a small concessions stand. It was enjoyable, except when the base was attacked by rockets or mortars. Then we had to put our full 'battle rattle' on and wait to be given the 'All Clear' signal. Good times. 'Mig Alley' closeup.